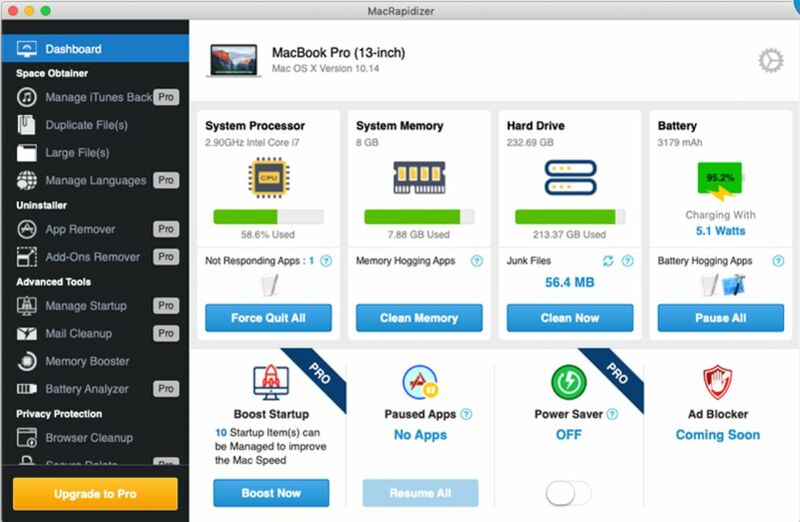 MacRapidizer Pro is a Potentially Unwanted Program, that claims to boost your Mac computer’s performance by removing malware with temporary files and optimizing your system. Though it will demand payment after scanning your system in order to “help” you with your system’s issues. However, it’s not true, probably there is nothing wrong with your Mac, that’s why recommend you to refuse to buy the full version of this badware. In this article we’ll explain how to remove MacRapidizer Pro. The only and one purpose of such applications is to earn easy money without doing any good to you. Completely opposite, MacRapidizer Pro will freeze your Mac as it will generate pop-up ads, slow down your computer’s performance and display disturbing messages. Don’t trust MacRapidizer Pro, its developers just want you to pay them for nothing. That’s why we advise you to remove MacRapidizer Pro as soon as possible. How to remove MacRapidizer Pro from your computer? This application is able to remove MacRapidizer Pro with all leftovers from you Mac automatically. Simple, user-friendly and effective. In order to get rid of MacRapidizer Pro, first thing you need to do is to uninstall malicious program from your Mac computer. When removing MacRapidizer Pro, try to find suspicious recently installed programs and delete them too, as it’s pretty common that any malware comes with some other unwanted programs. Search for MacRapidizer Pro or MacRapidizer Pro Uninstaller, then choose it and follow instructions. Once you’ve uninstalled the application, remove MacRapidizer Pro from your web browser. You need to search for recently-installed suspicious add-ons and extensions. Search for suspicious and unknown extensions that may be related to MacRapidizer Pro. There are all the manual instructions that will help you to find MacRapidizer Pro on your Mac computer and remove it. The most effective method to get rid of MacRapidizer Pro is to perform the manual removal instructions and then use Combo Cleaner Antivirus automatic tool. The manual method will weaken the malicious program and the program will remove it. Thank you for your attention.